This book is huge but I like it. Reading it on an iphone breaks it up into bits. I skim until I get to the interesting parts. I use it as a treat to keep pushing. Yes, nerd alert. I’m reading on the cloud these days and loving it. I bought a Kindle from a friend and am enjoying the fact that I can read a book “on the cloud.” I can read on various computers, my ipad, and my iphone. Ironically, it is not available on the actual kindle. I am reading The Making of Modern Japan, a massive book that I actually own a print version of. The estate of the author, Marius Jansen, is probably enjoying a few extra cups of coffee thanks to me. Reading on the cloud has become addictive but I am learning to use the addiction. 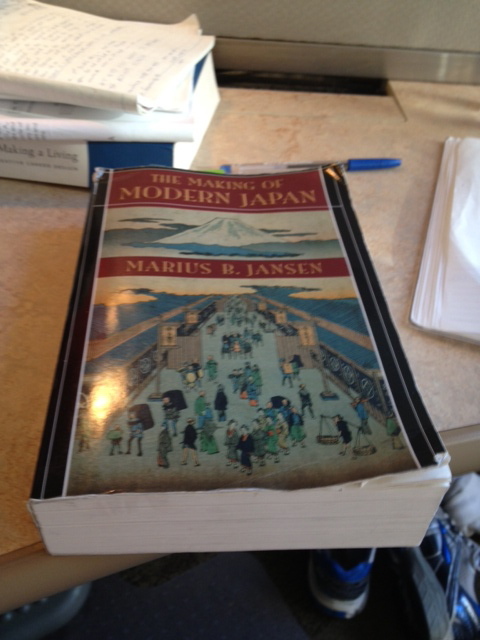 The Making of Modern Japan is not in Japanese and thus takes me a little bit away from my goal of Japanese fluency. But reading on the cloud has become addictive enough that I have learned to use it. When I noticed how much time and attention I was putting into the book, I decided to use the energy. In order to turn the page, I do a rep of electronic surusu flashcards. (What I really appreciate about these cards is that pretty soon after you do a few, it congratulates you on “repset finished” or something like that. You feel a sense of accomplishment and can move on.) You can substitute any short 2-3 minute “push” activity. After you finish you can briefly return to your non-harming addictive activity. So the next time you find yourself complaining that you just wasted a bunch of time looking at Facebook, think about how you can use the addictive pull towards healthy pushes. After checking a screen full of statuses, slide over to your guitar, tune it, and do one little exercise. Hey, don’t blame me if you end up practicing for half an hour. 🙂 You don’t have to practice for half an hour. Just five minutes and you can go back to your virtual paradise. Of course, I could hybridize my crack and find a really addictive book in Japanese and double the pleasure. But this book has been beckoning me for years but because of how large it is and how I have perceived time, I have avoided it. Now that I can read it in so many places, I am enjoying it. (I gloss over the mind-numbing stuff about bakufu administrative structures). So instead of being pissed off at myself for reading in English, I am surfing the pleasure wave and using it as an incentive to push a little more in Japanese. Use your non-fattening, non-harming mini-addictions. Become a pusher.